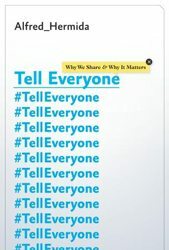 This is the position staked out by University of British Columbia professor Alfred Hermida, whose new book examines the ways social media have upended entrenched beliefs about the manner in which information is gathered and disseminated in the digital age. The ease of access and breadth of reach offered by Facebook, Twitter, YouTube, and their ilk have empowered a wide swath of ordinary people, turning them into citizen journalists and consumers with the power to make or break a Hollywood blockbuster’s opening weekend with a 140-character review. A former editor for BBC News online, Hermida is an unapologetic digital utopian, who believes that the ascendency of social media has made it possible to wrest power from the hands of government or corporate elites pursuing their own, usually venal, ends. He provides a brisk survey of the psychology underpinning the way people share information online: stories that make us happy are more likely to go viral than those that make us sad, though anger and disgust also turn out to be strong motivators for what gets liked, retweeted, and otherwise passed around. However, Hermida’s effusive digital boosterism renders his arguments one-sided and limited in their scope; the author cherry-picks the examples that suit his purpose and generally ignores anything that tends to undermine his own agenda. He is insistent about the importance of social media in elevating voices on the ground during the Arab Spring uprisings in 2011, though he neglects the argument – laid out persuasively by Evgeny Morozov in The Net Delusion – that the influence of social media on the popular movement has been overstated. He quotes poet and lyricist John Perry Barlow, now a fellow digital evangelist, as writing that people online should be free to “express [their] beliefs, no matter how singular, without fear of being coerced into silence or conformity,” but ignores the obvious way in which herd mentality operates online. Oversimplification, internal contradiction, and the staunch refusal to engage with – or in many cases even acknowledge – opposing views about the perils of an unfettered ability to disseminate (mis)information instantaneously to a global audience render Hermida’s analysis incomplete and unconvincing.